Have you started your new school year? How are you feeling? Excited, probably. Nervous? Almost certainly! Starting a new school year usually comes with some nerves about what to expect and the adjustment to your new routine. I'm going to talk you through three things I've identified most students struggle with at the start of a new academic year. Feeling nervous about the new year ahead is totally normal. Different students will have different degrees of nerves; some will only feel a faint flutter of trepidation, while others may walk in on their first day in a state of sheer terror! It can feel very daunting to have to step up your game after a relaxed summer holiday with very little routine. However, nerves are a good sign – feeling nervous about what's to come shows that you care about school and your work. Within days the nerves will have subsided, you'll feel more confident about what's being asked of you, and you'll wonder what you were ever nervous about! Starting a new school year means the relative freedom of the summer holidays is over, and it's time to step up to the demands of your course, your teachers and parents, as well as your own expectations. Getting back into a good school day routine can be a big transition, but give it a few days and you'll get back into it. Make the decision to give it your best shot – this will give you a great psychological boost too! The start of a new school year is the perfect time to start, tweak or change your school routines. Reflect back on last year: what worked? What didn't work? What can you improve on to make sure you have a really good routine in place this year? It's a great time to reset the habits that support you day-to-day. 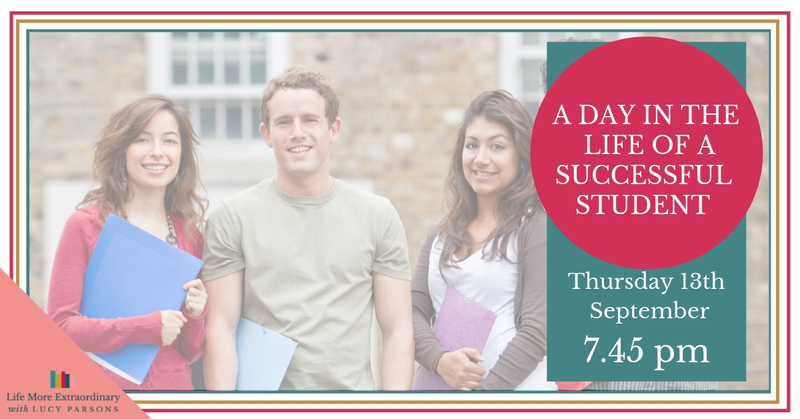 Take a look at my post on the weekly routine of a straight-A student for more information, or join me live on Thursday 13th September for my ‘A day in the life of a successful student' webinar. Click the link below to sign up and you can join me live as I talk you through how to develop habits and routines to help you settle into the new school year and see you through to the end of your studies successfully.